The Protection of Life During Pregnancy Bill gets its first outing in the Dáil this afternoon, before votes next week. 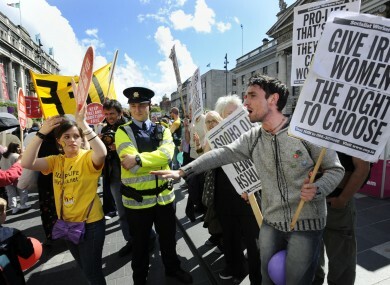 Pro-life and pro-choice protestors clash in Dublin during marches in 2009. A BILL TO legislate for abortion in limited circumstances will be debated in the Dáil today. The Protection of Life During Pregnancy Bill 2013 allows pregnancies to be terminated in cases where the life of the mother is at risk, and where that risk can only be addressed through ending the pregnancy. The Bill is aimed at bringing Irish statute law into line with the Supreme Court ruling in the X Case, in which it was determined that the Constitution’s equal weighting of the lives of a mother and her unborn child did not preclude a termination where it was needed to save the life of the mother. That ruling – which also explicitly determined that a threat to a woman’s life through the risk of suicide – was issued precisely 7,777 days ago today. In a subsequent ruling at the European Court of Human Rights, it was found that Ireland had breached the human rights of one woman by failing to offer a clear legal mechanism through which it could be determined whether she was entitled to a termination of not. One doctor will be required to sign off on a termination where the life of the mother is in immediate risk through a medical emergency, while two doctors will have to sign off on a termination in any case where the pregnancy does not pose an immediate risk to the life. In cases where the life is at risk through suicide, however, three doctors, including one psychiatrist, will be able to authorise a termination – a proposal which has emerged as the most controversial in the bill. Opponents of the clause cite medical evidence that terminating a pregnancy cannot be a cure for suicidal ideation in a pregnant woman, and see any legislation which legalises that practice as being fundamentally flawed. Email “TDs to hold first debates on new abortion bill today”. Feedback on “TDs to hold first debates on new abortion bill today”.